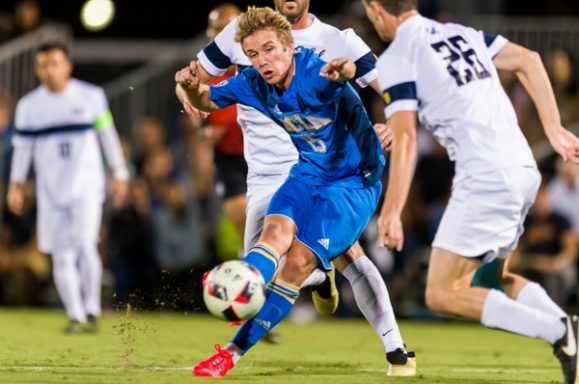 Bloomington, Minn. native Jackson Yueill has returned home for the holidays and withdrawn from the winter quarter at UCLA, electing instead to sign a professional contract ahead of next week’s MLS SuperDraft. On Wednesday, Major League Soccer announced Yueill as part of its 2017 Generation Adidas (GA) class. The midfielder is joined by ANB Futbol Academy product Adonijah Reid (forward), 2016 FC Edmonton midfielder Shamit Shome, Syracuse University defender Miles Robinson, and UCLA teammate Abu Danladi (forward). The announcement means Yueill will not be going abroad or finishing out his last two years at UCLA. It also means that the underclassman is eligible for next Friday’s MLS SuperDraft, where he is expected to be chosen in the top ten. In a mock draft published earlier today, Top Drawer Soccer projected Yueill going to the Houston Dynamo with the fourth-overall pick. Should Minnesota United retain the first pick in the SuperDraft, it will likely choose forward Jeremy Ebobisse, who is seen as the consensus best-available player. The rights to Ebobisse would certainly attract suitors, were the Loons inclined to trade down with an eye on local-lad Yueill. Alternatively, if Manny Lagos and Adrian Heath covet both Ebobisse and Yueill, FiftyFive.One’s Jeff Rueter speculated this morning on what it might cost the Loons to move up to grab Yueill. This past June, Yueill spoke to FiftyFive.One about his intentions to turn pro. With the 5-foot-10 midfielder now having made that decision, Minnesota United can get a clearer idea what it will cost to move back into the first round, if the club views him a worthy prospect. A product of the Minnesota Thunder Academy, Yueill received first-team All-Pac-12 honors in 2015 as a freshman, totaling seven goals, six assists, and 1,560 minutes across 20 games. This past season, as a sophomore, Yueill again was named to the All-Pac-12 first team, tallying two goals, 11 assists, and 1,589 minutes across 20 games. In September, Yueill set a Division I record by recording three assists in a 32-second run of play against then No. 1 ranked Akron. Additionally, the box-to-box midfielder’s play has earned him call-ups to both the U-18 and U-20 U.S. Men’s National Teams, where he’s logged 149 minutes across two games. GA is a joint venture between U.S. Soccer and MLS designed to entice select high school and college players to turn professional. The program offers players incentive-laden contracts and provides funding to obtain/complete college degrees, with the aim of reducing the risk shouldered by players foregoing or leaving college. GA players do not count toward a MLS team’s salary cap for a period of time. Notable past GA graduates include Jozy Altidore, DaMarcus Beasley, Kyle Beckerman, Carlos Bocanegra, Michael Bradley, Clint Dempsey, Maurice Edu, Brad Guzan, Tim Howard, Sacha Kljestan, Ben Olsen, and Nick Rimando. The last three top picks in the SuperDraft — Andre Blake, Cyle Larin, and Jack Harrison — are all on GA contracts.